When it comes to Japanese noodles, there are the big three: ramen, soba, and udon. 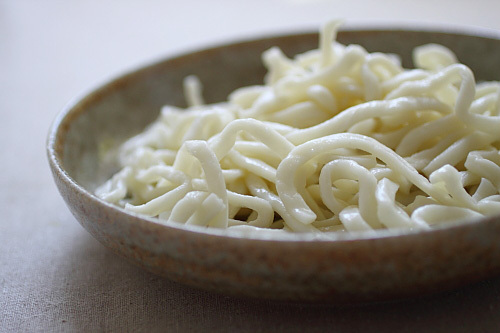 Udon (うどん) noodles are thick and white, made with wheat flour and salted water. One of the best way sto eat udon is Yaki Udon or stir-fried udon noodles, which is commonly made into pork or chicken yaki udon and shrimp yaki udon. In this easy yaki udon recipe, I will teach you how to make a classic yaki udon with pork, shrimp and vegetables. Udon noodles are available in Japanese or Asian food stores, or regular supermarkets with an Asian ingredients section. As with any noodles, you can find fresh, dried, or frozen udon. Fresh udon is ideal but dried or frozen udon noodles are quite good as long as you follow the cooking instructions. Udon is prized for its chewy texture yet totally smooth mouthfeel, so don’t overcook the udon noodles. One of the most common yaki noodles (means fried noodles) recipes is yaki udon, which is stir-fried udon, a dish that constantly reminds me of my first trip to Tokyo, where I had a serving of authentic yaki udon at a mom-and-pop eatery right beside my train station. Topped with some shaved bonito flakes and freshly pickled beni-shoga (Japanese pickled ginger), the taste of the yaki noodles still lingers in my mouth. Udon noodles are popular Japanese noodles and widely eaten. 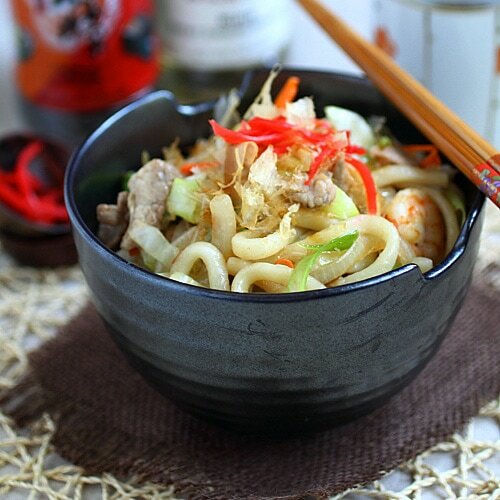 You can use udon noodles to make yaki udon-fried udon noodles with veggies and meat. Combine all the ingredients in the Seasonings in a small bowl. Set aside. Boil the udon per the packet instructions. Make sure not to overcook the udon. Rinse the udon with cold running water, making sure that there is no excess starch clinging to the noodles. Drain and set aside. Heat up a wok or skillet with the oil. Add the onion and sauté briefly, follow by the pork and shrimp. Add the cabbage, carrot, and stir a few times before adding the udon noodles. Add the Seasonings into the wok or skillet, stir continuously to combine well with all the ingredients. Add the scallions, stir a few more times, and transfer the yaki udon into a serving bowl. 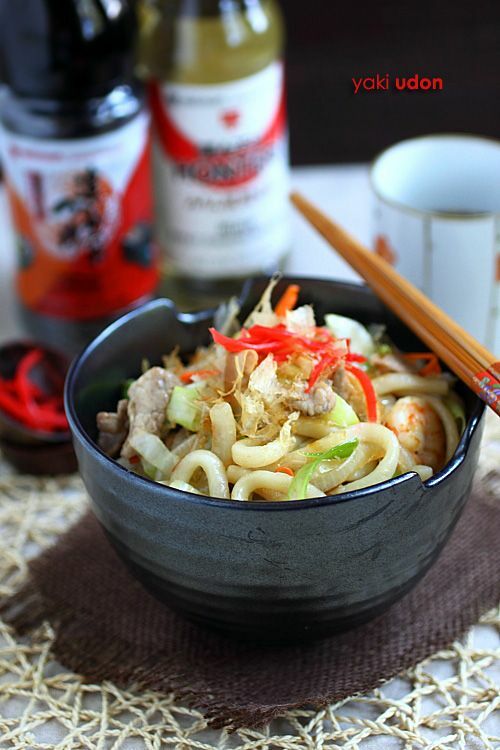 Top the yaki udon with some shaved bonito flakes, beni-shoga, and serve immediately. All photos and recipes on Rasa Malaysia are copyright protected. Please do not use the photos and recipes without prior written permission. If you wish to republish this recipe, please rewrite the recipe in your own words instead of copy and paste and link back to http://rasamalaysia.com/udon-noodles-yaki-udon/. Thank you very much! Love udon. Love to try your recipe. 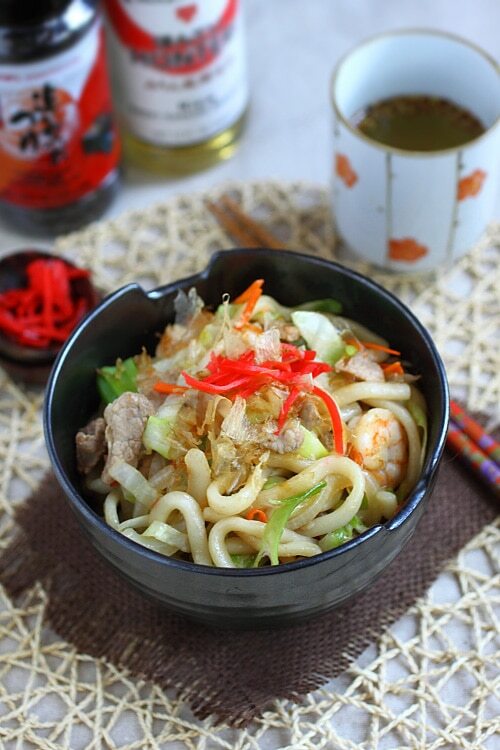 This yaki udon looks so delicious. I want to a bowl now. Rade – I can make you a bowl if you come visit me in CA. Hehe. I have to make this tonight. Just need to get the mirin sauce. Let’s hope the store on my way home has the Mizkan brand. where do you find the bonito flakes? are they also available in mizkan brand? and what kind of udon brand do you recommend? i never see these ingredients at vons ethnic food section. You can find the bonito flakes at Japanese or Asian markets. No, Mizkan makes Japanese condiments such as ponzu, rice vinegar, soup base, etc. They don’t make bonito flakes. For udon, I don’t have any particular brand that I like. You can just get the frozen udon or those udon packed in a plastic packet, but not those with a seasoning pouch. There is no chili powder in the authentic yaki-udon recipe, but if you like, you can splash some togarashi (Japanese 7 spice). I’ll be trying this when I get home tonight…but minus the pork and shrimp. Any suggestions for vegetarian substitute ingredients? this looks healthier than a jenny craig diet!! LOL, you are funny. It’s much healthier, too. I ran out and got everything to make this tonight, even my 2 year old loved it! Yummy yum yum!! :) I’d love to try this recipe! P.S. : I am one of your lucky fans staying in Singapore, and I just got your cookbook last Sunday. I love it!!!! Especially the tips on how to cook great chinese food, and of course, the beautiful photographs. Love noodles!! I am always torn at a Japanese restaurant between ramen or udon. Since I cannot make ramen at home, this udon recipe will be great for home cooked meals. Thank you for the Mizkan recommendations, too. They are the best additions to my kitchen. oh, I love udon. This recipe looks very simple. Definitely gonna try it out. Bee, thanks for sharing. I’ll be spending this July 4th weekend in San Francisco. Do you know if I can still get all the ingredients in Japan town? Since I cannot get anything here in Marin County, I want to make sure I get all my shopping done while I am in the city. This noodles was a big hit this past weekend with my family. I didn’t plan on it until I passed by the korean market. Went in and was so happpy to find Mizkan products. It was lots of work when it comes to making 1 bowl at a time for each family member but they all loved it once served. Thanks for sharing!! I just came across your site just browsing….Really nice site n pictures. Really excited in trying a few recipes i have been searching for. I was wondering, either i couldn’t find it or it’s not up was, recipe for Chinese Broccoli, just had it for dinner , yum………. I tried this recipe it was really good but my udon turned out brown instead of white i used dry udon instead of instant, and my noodles were skinny. I will try again with instant. Hello. I can only find bonito flavored seasoning in dry form. Can i make it with the powder? 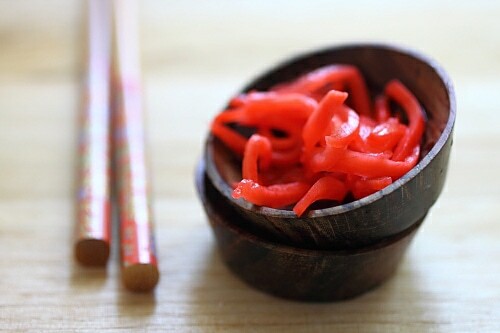 Then you can dilute it in 3 ways for miso, chige, or hot noodle wich one to use? Thank you. Wow! Thanks for the recipe. It calls for two tbsp of oil. Would that be vegetable oil? We made this a few weeks ago and it was an instant favorite. My husband said it was in his to top ten. I didn’t even know he had a top ten! Anyway we had company over twice in the last three days and we made this dish both times and everyone enjoyed it greatly. A shortcut that we have employed is to use a bag of shredded cabbage with cabbage strips (coleslaw mix) and we throw in some frozen snow peas to add vegetables. A keeper! Thank you so much!